March 2, 2018 | 9 a.m. When Bethel Professor of Music Emeritus Mary Fall graduated with her master's degree from then-MacPhail College of Music, her first instinct was to pursue a voice instructor position in a Christ-centered setting. "The next thing you know, I was getting a call to teach!" she recalls. She started at Bethel in fall 1967 as an adjunct, teaching one-on-one voice lessons one day a week, and eventually become a beloved, full-time vocal teacher and director. With the Women's Choir, she toured Europe and "all across the United States-from New York to California, Arizona to Duluth!" she recalls, and describes fondly the day one of her students won the National Association of Teachers of Singing (NATS) state vocal contest. For Mary, music, faith, and learning were always intertwined, and she loved being able to pour into the next generation of Christian musicians. When Mary retired after a 22-year career in 1988, The Clarion student newspaper published her reflections on her Bethel tenure and plan for retirement. "They are all great young people," Mary told student reporters. "They do seem younger than those 21 years ago, though. Could it be? The students now are so busy. There is more competition for 'time' now." Those words were prophetic then, and they seem even truer of today's Bethel students. 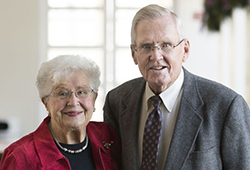 Mary and her husband, Warren-a lifelong construction estimator and later supervisor of campus facilities for the University of Northwestern-St Paul-took a month-long, cross-country vacation to visit family after their retirement. Then they set about building a life where they'd give liberally of their time and resources to support ministry, especially music education. They've since volunteered at a Christian retreat center in Austria, cooked with Loaves & Fishes for an inner-city women's outreach, and Mary has sung with her church choir and been a member of the board at St. Paul's Schubert Club. Seeing the great impact Bethel had on their two alumni daughters-and wanting to ensure a bright future for Christian education in the midst of a changing world-they've also supported Bethel faithfully. Recently, they set up a charitable gift annuity, from which they receive annual income-giving them added stability in retirement-while other proceeds benefit Bethel vocal students through a scholarship. "Bethel helped me put my girls through college-I want nothing more than to give back," Mary says. "This is a good way for us to do that. It's a personal choice-but I know our support couldn't go to a better place." "It has a dual purpose," Warren adds. "We get some benefit, but it also helps students along the way. That's really what it's all about-we want to be a part of this ministry as long as we can." Annually, the Falls enjoy coming back to Bethel's campus for Festival of Christmas, where they see their support come to life in the form of hundreds of student musicians. Warren is quick to note how much the concerts have changed since they began attending them at Bethel's old Snelling Avenue campus in the 1960's. "It's so much more detailed, and the technology has advanced so much. It's amazing how much Festival has improved in that time; it's kind of overwhelming, really," he says. "But the heart of it all-the ministry focus-is still very much the same." For Mary, Festival brings back a flood of memories from decades spent in the music department. "It's a bit of relief!" she says, with a chuckle. "That's such a busy time of year, for the staff and students, to get Festival going." Knowing firsthand the hard work and dedication embodied by the countless Christ-followers who have attended and taught in Bethel's music department over the years, Mary is thrilled to know her investment will continue to bless talented students for years to come. "It's so pleasant to sit back and enjoy that wonderful music, to know we've played a part in it," Mary says. Learn more about how a Charitable Gift Annuities and how you can advance Bethel's mission .